It's getting harder and harder to see new birds, but I get more and more pleasure out of each new sighting. 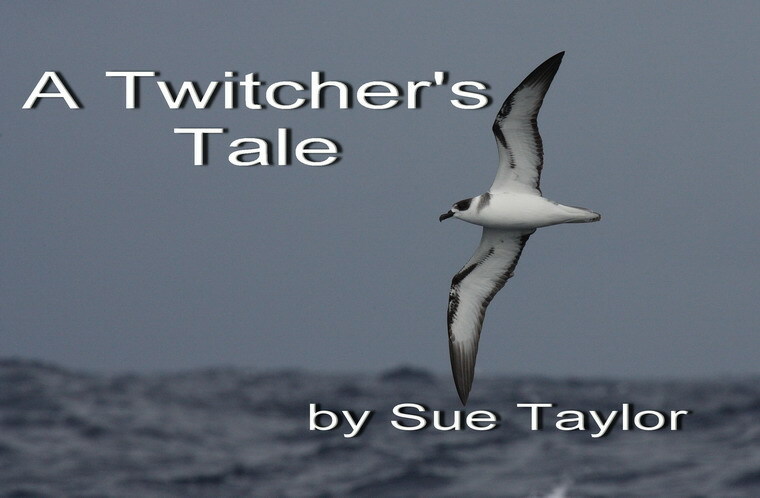 Last weekend I visited Tasmania and did two pelagics out of Eaglehawk Neck. The highlight was seeing a Westland Petrel - a new bird for me. 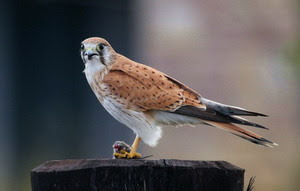 We had good views on Saturday, then, just for fun, more sightings on Sunday. There were other exciting occurrences too, my first 'brocken spectre' from the plane on the way down, Sooty Albatross (more than one! 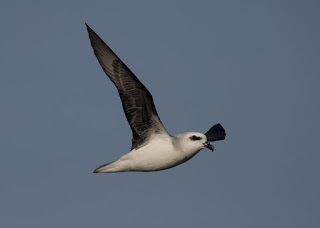 ), White-headed Petrels (always a favourite) and others on the boat (not me, sadly) saw a Black-bellied Storm Petrel - as far as I know, never recorded before here in May. My friend Els Wakefield was picking me up from the airport in Hobart and she said 'Come early, and we'll have a day's birding.' She didn't have to say that twice! I was up at 5.30 and on the 8.15 plane. Weather was fine as we took off and flew through the cloud cover. Above the clouds, as far as I could see in every direction was fluffy white cotton wool. Then I saw a magnificent spectacle. A pink ring on the clouds, with the shadow of our plane in the centre. It was breath taking. Clever Els told me it was called a 'brocken spectre.' I'd never heard of it and certainly never seen one before. A good omen I thought. Els and I had a lovely day birding on Friday. We saw 53 species and had a delicious lunch at the Waterfront Cafe in Dunally. Els was delighted to show me a couple of Pink-eared Ducks - a rare vagrant in Tasmania. I always love pinkies, but I'm afraid I didn't display as much enthusiasm for this common Victorian bird as Els thought they deserved. For me, the highlight was a couple of Hooded Dotterels on the beach at Marion Bay. We saw several Flame and Scarlet Robins, but dipped on Dusky. I was a bit disappointed to see a total of 16 kookaburras during the day - I don't remember seeing that many on previous visits to Tasmania. Laughing Kookaburras (along with Superb Lyrebirds) were introduced to Tasmania and don't belong there. At Eaglehawk Neck, we stayed at the Lufra. It was a special jazz weekend. The hotel was full, the atmosphere was cheerful and the music was fantastic. On Saturday morning, we arrived at Pirates Bay before 7, but far from the usual sleepy cove, the place was humming. There was a fishing competition on and there must have been 50 fishing trailers all trying to launch their boats simultaneously. There were fishermen, boats, and four wheel drives bumper to bumper. The small group of birders who usually had the wharf to themselves had to weave their way between fishermen. I managed to board the Pauletta without falling over - always an achievement for me. It was a great day. I had a list of 35 species which had ever been recorded here in May. Of these I saw 23 on Saturday. Other people saw more. I saw 26 on Sunday and again, others saw more. 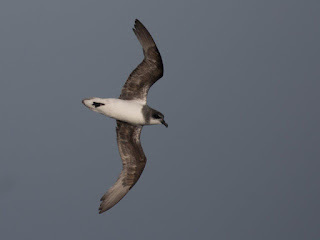 I didn't see the Grey Petrel others saw or the aforementioned Black-bellied Storm Petrel. 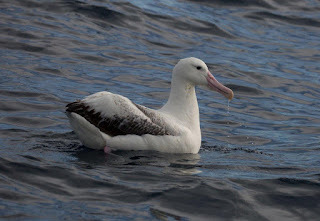 The Sooty Albatross we saw on Sunday was not on the list. A Crescent Honeyeater landed on the aerial while we cruised past the Hippolytes. I didn't see it. I was busy watching a peregrine attacking a sea eagle. Saturday was a day of albatross and Sunday was a day of prions. At one stage on Saturday, we had over 50 Shy Albatross sitting around the boat. We also saw Buller's, Campbell's, Wandering and a Southern Royal, and a couple of Sooties on Sunday. 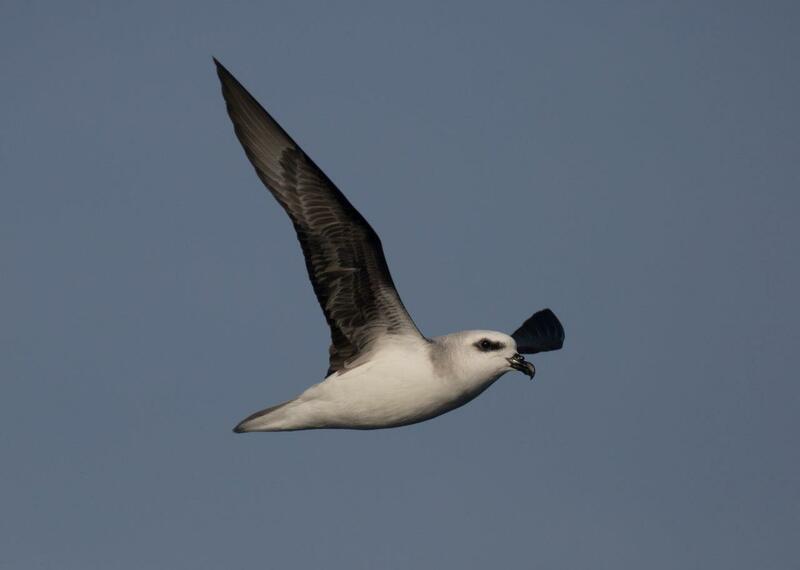 We saw several Common Diving Petrel, lots of Cape Petrel, a sprinkling of Northern Giant Petrels (with just one Southern on Sunday). There were Soft-plumaged, White-headed, Great Winged, Grey-faced Petrels and of course, most importantly, the Westland. As to Storm Petrels, I saw Wilson's and Grey-backed. Others saw White-faced and, exceptionally, Black-bellied. I was sorry I missed the Grey Petrel - it didn't hang around - but I had an inward glow from my Westland and I wasn't complaining. It was cold. In fact, I don't remember ever being so cold. On Sunday, I borrowed a jumper and a neck warmer, and they helped. So did the second cup of coffee that the skipper kindly gave me. I must have been cold because I ring I have worn since 1970 fell off my finger. That's never happened before. I lost it in Els' car, but (bless her!) she found it. We had expected choppy seas on Sunday, but it wasn't too bad at all. Altogether a very successful weekend. Let's face it, any time I get a lifer, it's successful. But this was particularly enjoyable. 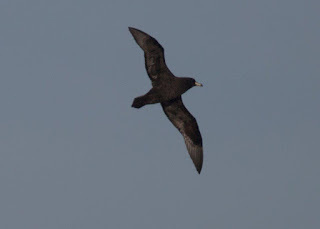 The Eaglehawk Neck pelagics are always very friendly and usually produce a good birdlist. We did well. Thanks to Paul Brooks for organizing the pelagic, to Els for all her help (and her photos), and to everyone on the boat for making it such an enjoyable weekend. Of course, the main reason for my trip, was to see a Southern Fulmar, and in that I failed miserably. I'll just have to go back in 2019. What a shame.